NSA was authorized by the Walla Walla District, Washington State, of the Army Corps of Engineers (USACE) to compile and synthesize aquatic habitat data from the Snake River from 1983 to 2010. The compiled report has helped the USACE to evaluate environmentally acceptable and beneficial measures for managing dredged sediment in the Snake River system, particularly the effects of sediment disposal on salmonid fish populations. Results of existing studies and studies conducted in the lower Columbia River and its estuary suggest that creating shallow water habitat benefit endangered Snake River salmon fish (salmonids) by providing feeding and rearing areas, in contrast to the current habitat limited condition of the reservoirs. Richard Turner, Project Manager and Contracting Officer’s Representative (COR), USACE, richard.c.turner@usace.army.mil, (509) 527-7625. Surveying and monitoring biological and physical characteristics within defined 2-3 acre plots using GPS and field data sheets at 22 sites along the East and West coasts of Florida. Working in extreme environmental conditions with field crews and equipment. Providing data and results to predetermined government standards of performance. Compiling and analyzing significant amounts of biological and physical data. Contract W912EP-10-C-0027. Sue Kemp, Biologist, USACE, Susan.K.Kemp@usace.army.mil, 904-232-2017. The study was designed to better understand the contaminant load in lower trophic levels of the aquatic food web and the relationship to abandoned mines on public lands, specifically the Red Devil Mine (RDM), an abandoned cinnabar mining and mercury (Hg) retort site on the banks of the Kuskokwim River in western Alaska. The resulting information was used in the remediation of abandoned mines and subsequent sampling to monitor contaminant levels in the future. The mine was first opened in the 1930’s and closed in 1971. During the mid-1950’s, RDM was a leading producer of mercury; production records indicate that at least 35,000 flask of mercury were produced there, which equates to roughly 1,330 tons. NSA was responsible for collecting data on 17 permanently marked 10-Plot trend transects as part of range health assessment in western Wyoming. Each transect consisted of ten (10) 9.6 square foot plots located along transect lines varying in length up to 1,000 ft.
NSA provided a minimum of 2 personnel on each transect in the field, as well as equipment, tools, materials, supervision, and other items, and incidental services necessary to perform trend monitoring. The total area covered during the survey was approximately 82,000 acres across three counties. BLM Worland, Wyoming District. Contract L12PX01088. Range Health Monitoring. Mike Peck, mpeck@blm.gov. NSA completed a habitat survey along 200 miles of the Yellowstone River in August 2012 to map potential tern and plover habitat. Habitat data was collected with Garmin GPS units and converted into ArcMap Shapefiles using DNR GPS (Minnesota Department of Natural Resources) and ArcMap 10. Bureau of Land Management, Miles City, Montana Field Office. Contract No. L12PS00612, Yellowstone River/Interior Least Tern/Piping Plover Habitat Assessment. BLM Order No. L12PX01143, Rebecca A. Undlin, Contracting Officer, BLM, 406-233-2829. 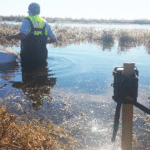 NSA provided all services for surveying endangered and threatened species within specified areas of Three Forks Marsh Conservation Area (TFMCA) in Brevard County, Florida. NSA assembled and reviewed existing natural resource data relevant to the proposed project with an emphasis on determining the threatened and endangered species occuring on project lands. The data review included St. Johns River Water Management District (SJRWMD) maps, Florida Natural Area Inventory lists of protected species, USFWS information on protected species, USACE and SJRWMD project documents, land use classification maps, aerial photographs, and other reports regarding natural resources within or in immediate proximity to the project. NSA also interviewed appropriate land managers for species accounts on project lands and adjacent properties. NSA conducted field surveys to determine the presence or absence of federally or state listed threatened and endangered species. Field surveys were performed within the specified areas of TFMCA. Observations of wood stork, bald eagle, snail kite, osprey and Audubon’s crested caracara nests were conducted. Identified nesting locations of these species were marked using GPS. All indigo snakes were recorded and observation locations marked using GPS. All incidental sightings of threatened and endangered species were recorded and observation locations marked using GPS. NSA assembled and reviewed existing scientific literature and data relevant to the proposed project nesting survey, with an emphasis on caracara (Caracara cheriway) historical habitat use, distribution, nesting behavior, threats, disturbance, and all other scientific surveys conducted for this species. The data reviewed included pre-survey evaluations of maps, including, but not limited to, aerial photographic maps with detailed contract areas provided by the USACE, U.S. Geological Survey (USGS) 7.5 minute topographic maps, U.S. Department of Agriculture (USDA) soils maps maintained by the Natural Resource Conservation Service (NRCS), and South Florida Water Management District (SFWMD) maps. All data, literature, and reports were compiled for review prior to meetings and/or field work. NSA provided services for the Comprehensive Everglades Restoration Program (CERP) monitoring data analysis, formatting and loading. Analysis consisted of ensuring that appropriate scientific data elements by type, applied and loaded into the Morpho data management system. NSA formatted data that was loaded to Morpho into CID approved templates and triggered the process for loading. Data load processes relied on positional location of data for the process to load correctly. Guidelines for formatting the data complied with standard templates and were strictly followed. All work was completed and delivered on the CERPZone. USACE Jacksonville District. Contract No. W912EP-12-P-0043. Sue Kemp, Biologist, susan.k.kemp@usace.arrmy.mil, 904-232-2017. NSA completed revised forest management plans for the Winnebago and Omaha Indian Tribes in eastern Nebraska for the Bureau of Indian Affairs. As part of the assignment, we analyzed and compiled BIA provided forest acreage and other resource information (climatic, habitat, range, soil, wildlife, watershed, etc.) as necessary to prepare the draft amendment of the current forest management plan document, in compliance with NEPA, and following the minimum content requirements. NSA ascertained the wants and wishes of the Tribes and its members as to the management of their forest resources. Alternatives as considered in the NEPA phase of the project, and the preferred alternative used to amend the forest management plan, were based on discussions with adult members of the Tribe’s and the Tribal Councils. Reservation wide meetings, held at the District level, were used to determine tribal member issues, wants and needs. BIA Rocky Mountain Region, Billings, Montana. BIA Contracts A12PX91365 and A12PX91348. Dan Rasmussen, 406-247-7941. Objective: Collaborate with USGS hydrologists to assemble, analyze, interpret, and communicate hydrologic and water-quality data; initially focusing on models for estimating nutrient and sediment loads entering the Chesapeake Bay watershed. NSA staff is researching a new method to explore potential drivers of water-quality trends using differential spatially-referenced regression in the Chesapeake Bay watershed. A new method is desired to establish direct linkages between regional patterns of observed water-quality changes and drivers. Examples include management actions, watershed properties and climatic forcing variations, within finite time scales. The resulting model can be used for predicting water-quality effects under various management scenarios in a spatially-distributed dynamic watershed system. This new methodology is expected to be published in 2018. Objective: Mapping and identifying sediment ridge features found on the inner continental shelf offshore in the Delmarva (Delaware-Maryland-Virginia) Peninsula. NSA researchers are developing auto-classification methods to identify these ridge features and create geospatial images of their locations. Identifying these offshore sediment features helps to better constrain controls on coastal vulnerability and evolution, the region’s sediment sources, transport pathways and sinks with the over-arching goal of understanding the coastal geological framework of this area at storm-event and longer time scales. Objective: Determine the impacts of temperature, energy use and efficiency of fish passage facilities pm the spawning success of American shad. American shad (Alosa sapidissima) is an economically and ecologically important anadromous species native to eastern North America. Many American shad populations have declined due to the impact of dams on their upstream migration. Understanding how American shad utilize their energy resources during upstream migration is critical to designing effective fish passage ways around dams and the overall conservation of a species that is important to recreational and commercial fisheries. For this project, NSA staff is measuring American shad fat content with new microwave-based technology called the Fatmeter. Objectives: Maintain the overall quality of the bird banding and band encounter data used for research, management, and conservation of migratory bird populations and digitize BBL banding schedules. Since 1920, the Bird Banding Laboratory (BBL) has tracked the data obtained from birds banded in North America. However, these hundreds of thousands of entries have been most inaccessible. The BBL has several hundred bird banding schedules representing thousands of banding events prepared to scan and digitize. The data from these bands allows researchers to study bird migration, behavior, life-span and survival, and population health and growth. This data has enabled managers to set science-based hunting regulations. Under the direction of NSA and USGS, one important component of this work involves teaching student volunteers how to scan documents for digitization and to track data using spreadsheets. These students work tirelessly to digitize this banding information and have scanned almost 180,000 sheets of banding data since 2015 and can now be uploaded to the BBL data system. In addition, the data is utilized in the Biodiversity Information Serving Our Nation (BISON) web app which is the U.S. Federal resource for biological occurrence data. Investigate and display the spatio-temporal behavior of waterfowl as it relates to habitat and avian influenza in China and the American Midwest. The project with Chinese data involves using habitat variables to determine habitat suitability by species to create an image demonstrating suitable habitat during the wintering and breeding seasons. These species level images are then merged to create species richness maps by season. The project with American Midwest data compares the timing of teal migration with outbreaks of avian influenza, as well as documenting stopover and migration ecology. Visualize migration paths, stopover behavior, and land use during stopovers in Hong Kong to inform scientists of risks concerning avian influenza dispersal through this region. This project will help to inform scientists of risks concerning avian influenza dispersal through this region. Objective: Assess the health and status of coral reefs in the U.S. and U.S.-Affiliated pacific Islands. This work falls under the Coastal and Marine Ecosystems Science research theme which is a program within USGS’s Natural Hazards mission area. NSA staff is mapping U.S. Coral Reef Task Force designated Priority Study Areas such as the coral reef in Faga‘alu Bay, Tutuila, American Samoa and various locations in the Hawaiian Islands. Additionally, the project involves acquisition and maintenance of geospatial databases for the Coral Reef Project and Marine Geomorphology, Evolution, and Habitats Project using ArcGIS and other various software packages. Figures and maps are also generated for publication and produces video sequences for the Coral Reef Project public relations. Finally, as a part of the project, NSA staff is assisting with the deployment of several passive membrane samplers in West Maui to assess organic compounds and contaminant inputs to diverse shallow water coral reef ecosystems. Objective: Provide support to the Special Studies group to further the understanding of geologic processes and natural resources of the United States and internationally. Objective: Evaluate fish and other aquatic species population dynamics over large spatial and temporal scales for precise abundance and trend modeling in response to management and climate-change scenarios. NSA staff is leading USGS teams to collect field data on freshwater habitats of fishes, benthic macroinvertebrates, and amphibians to assist in watershed analysis relevant for fish and wildlife population and community dynamics, and habitat suitability assessments. For this project, staff is developing and managing environmental databases for fish and aquatic biota and their habitats; developing and maintaining computer databases; and collecting and analyzing data from field surveys and field and laboratory experiments (i.e., experimental streams).